Gold investments, on the whole, have continually been solid investments, especially in the long run. When you make an investment in gold, you can either do it with hard metal such as bullion, bullion coins or gold coins that are (or were) used as legal tender. However, many people like to use “paper” gold since these investments, theoretically tied to gold in one way or another, doesn’t involve having to cope with the hard metal itself. For those who play the stock market commodities game, the futures and options markets are a more attractive investment opportunity. 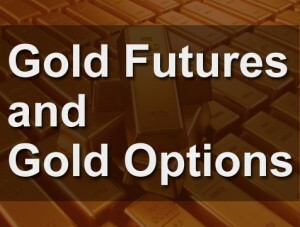 Gold futures and options are both tied directly to the spot value of gold on a daily basis. However, there are significant differences between a future and an option. A future is a binding contract handled through an exchange which states the buyer (the “long) will purchase a specified amount of gold from the seller (the “short”) at a specific date in the future. The price for the purchase is an agreed upon price at the initiation of the contract with monies set aside by both parties to cover price fluctuations (the margin). This margin is adjusted daily between the two contractees by the exchange and, if one side of the margin is exhausted, a margin call is issued so that contractee can replenish their side of the margin. Then, at the agreed upon date, the funds and the gold is exchanged. Options, much like futures, are contracts between a buyer and a seller for a specified amount of gold. However, instead of being a set contract, the option enables the buyer to purchase the gold prior to that date (a “call”) for which he pays a premium. The seller can can opt to sell the gold for a specific price as well (called a “put”) which makes options more flexible and more easily traded than futures are. While these are well-suited to a fast paced trading environment, for those looking for a more stable investment, hard metal is preferred. Futures and options give you flexibility with your investment dollars since you can buy and sell both futures and options quickly on the open market without dealing with the hard metal hassles, but they lack the solidity of being able to hold gold in your hands.